Published on April 11, 2011 in Photography and Skateboarding. 2 Comments Tags: Action Sports, bondi beach, bowlarama, News, Photography, Skateboarding. 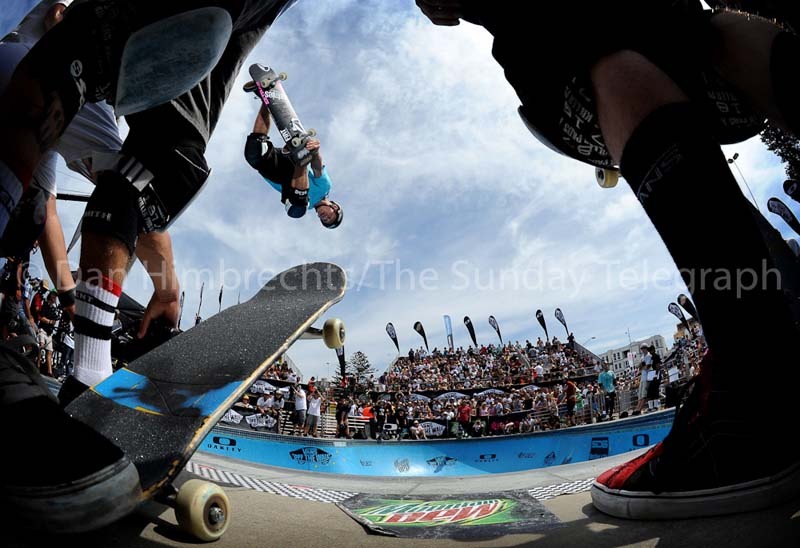 A while back I was assigned to shoot the annual Bondi Bowl-A-Rama skateboarding contest, for The Sunday Telegraph. As skateboarding was what got me into photography back in my teen years, it seemed like I had come full circle by being back on the deck of a bowl with my fisheye lens photographing skateboarding – but this time for a major newspaper. Competitions like this are always hard to shoot.before the competition they had me check out these helmets for my protection during the games, and they can be use for almost everything passes are handed out to seemingly anyone with a DSLR, and add to that the endless line of filmers and lurkers and you have yourself one crowded skate bowl with particularly ugly backgrounds. i.e other cameras and flashes. I decided to just have a bit of fun with it, and was super happy with this image, which I managed to nab just before I had to head back to the car to file the shots back to the paper. Published on February 20, 2010 in Photography and Sport. 6 Comments Tags: Mogul skiing, Opening Ceremony, Photography, Vancouver 2010, Winter Olympics. I’ve been trying to do this post for at least four days now. Time is not something that is readily available when you’re shooting an Olympic Games. I’ve spent the last week constantly on buses between venues and walking from drop off point to security, then more walking, then a shuttle bus, then more walking – fast walking, trying to get to a good spot as fast as possible. The buses in theory are probably a good place to get some of these blog posts done, but then again they are one of the few chances to get some sleep. Today I fell asleep with a half full cup of coffee in my hand – Tim Horton’s, your coffee clearly isn’t strong enough. 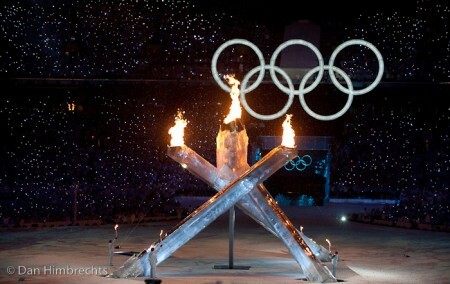 The games are dominated by the big photo agencies, Getty, Reuters, Assocociated Press, and Agence France Presse. These agencies get all the best positions at every event reserved for them, they have card runners constantly collecting their memory cards and running them back to pictures editors to get the shots on the wire before the event has even finished. For all the other photographers it’s a free-for-all. There are limited positions and for the most part, the angle or the shot from those positions isn’t clean and you are squeezing in with 20-30 other people trying not to hit the guy in front on the head with your 400mm lens (sorry to the dude from The Oregonian, or whatever newspaper you were from, it wont happen again!) It forces you to look for a different shot, and that is a damn good thing. It’s exciting hearing 30 cameras’ motor drives chattering away like some crazy summer insect on steroids, it’s cool to talk shop with photographers from all around the globe, it’s great to try to teach newspaper guys how snowboarding works, and even better when they start showing you the shots on their camera, clearly stoked they’ve made a nice frame.